Update: Flash the SuperSU 2.82 SR4 to root the latest Android 8.0.0 Oreo and Android 7.1.2 Nougat on Nexus 6P, 5X, 6, 9, Nexus Player, and Google Pixel C. This will also help root custom ROMS based on Lineage OS 15 unofficial or otherwise. If you own a Nexus phone then chances are you have already updated your device with the latest official Android 8.0 Oreo or the official Android 7.1 Nougat firmware. We have also seen the latest September 2017 security patch level from AOSP. This brings the newer firmware build number 8.0.0 OPR3.170623.007 to the Google Pixel and Nexus range. This includes the Google Pixel (XL), Nexus 5X, Nexus 6P, 9, and the Pixel C. Unfortunately, software support for Nexus 6, 5 and 7 are now officially discontinued. Here you will find rooting tutorials for Oreo and Nougat. We have already seen custom ROMS based on Oreo popping up like AOSP 8.0 ROM ports, and LineageOS 15. This has been a game-changing week for the Android community as you can the same for your device too. Many manufacturers are now working on releasing a build for the Android 8.0 Oreo including Samsung, Asus, Motorola, OnePlus, Sony, and many more. So here’s a tutorial to show you how to root it before the official Android firmware show up. You can root custom ROMS like Lineage OS, Resurrection Remix, Paranoid Android etc. However, your Android phone needs to be setup with custom recovery like TWRP and also Bootloader Unlocked. Now that you have updated your Android device, you may be missing the root access. After all, Android is all about customizing, modding, and personalizing. Following are 2 unique procedures to root your Nexus device or any device running on Nougat or Oreo. The second is the Magisk method. All these procedures require you to unlock the bootloader first. So head over to the instructions below to root. Warning: Once you root or install a custom package like TWRP, your warranty may be void. Even though these procedures have been tested working, you should still be cautious. We at AndroidSage won’t be liable for any damage to your Android device. Reader’s discretion is advised. Before you proceed with the instructions, first you will need to go through the following prerequisites/requirements. These are mandatory for any rooting procedure. 1. Verify your device for compatibility. The listed firmware is compatible with Nexus series devices only. 4. You will need to unlock the bootloader on the latest Android 7.0 Nougat firmware on your Nexus. The procedure is given below in the first method. 5. For ADB and Fastboot download the quick ADB and Fastboot Installer from here. You may also like Universal ADB drivers. 6. Also, download and install the latest Android USB drivers in order to make the procedure working flawlessly so you don’t come across any connectivity issues or errors. Method 1: How to Root Nexus on official AOSP Android 8.0 Oreo with TWRP and SuperSU? The bootloader is the first step towards the advanced development of an Android device and to tinker with your device. So in order to setup TWRP onto your Nexus device, first make sure your device’s bootloader is unlocked. Follow the instructions below to first unlock the bootloader then install TWRP, and ultimately root the device with latest SuperSU. Note: If you have already unlocked the bootloader on your Nexus device, then directly head over to the instructions to flash the TWRP recovery. Download and flash the latest TWRP v3.0.2.1 from the link given in the download section. It will help your bypass the Forced Encryption and dm-verity while installing custom files via TWRP or even while booting. Step 1: First, make sure you have been through the requirements section above. It will help you in all 3 procedures. Step 2: Make sure that you setup ADB and Fastboot on your PC (files in the prerequisites). Trust the connection by checking “Always allow from this computer” when you plug in your Android device to your PC for the first time. 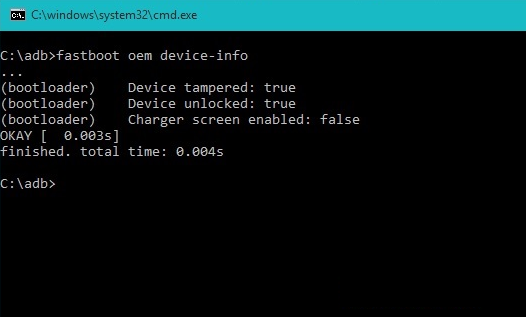 Step 3: Now keep the device plugged in and open a command prompt or terminal on your PC. You can simply click the address/location bar in Windows and type “cmd”. Alternatively, hold the shift key on the keyboard and right-click on an empty space and select “Open command window here” option to launch a cmd window. 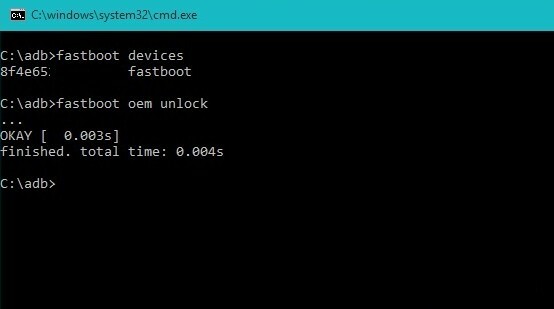 Step 5: Once you boot into the fastboot mode (bootloader mode), issue the following command in the command prompt to check your device connectivity. It should provide you with some device code. Check screenshots below. Step 6: This is optional, but you can still proceed. Now issue the following command to get the bootloader unlock status on your device. This is the older unlock bootloader code used for Nexus 5, 6, 9, 7, etc. For newer devices, check below. Congratulations! You have successfully unlocked the bootloader. Now you can easily setup a custom TWRP recovery and flash SuperSU using the following instructions. This will first flash the TWRP recovery. Once that is done, you can flash SuperSU via TWRP. We have a detailed tutorial and alternate methods to flash the TWRP recovery. You can either click here if you need more instructions or just follow the instructions below. Step 1: Reboot your device once and reboot back into the fastboot mode (Bootloader mode) See steps 1 to 5 in above method. Step 2: Navigate to the location where you have placed the Nexus TWRP recovery image file. Rename the recovery file to a simple one, like recovery.img. While the folder with recovery.img file is open, launch command prompt or terminal. Step 3: Now flash the recovery image. Issue the following command for that. Note that, you need to use the correct file name with proper extension. Step 4: Wait until the recovery gets installed. Once the installation completes, you can now enjoy your new firmware. Alternatively, while, on Mac OS, you can issue “./fastboot flash recovery recovery.img” command or on Linux type “sudo fastboot flash recovery recovery.img” to flash the TWRP. How to Root Android 8.0/7.1 OS using TWRP? Make sure you have TWRP installed. Once you install TWRP, it’s time to root. Place the latest Magisk/SuperSU package in your device’s internal storage or SDcard. Boot your device into the custom TWRP recovery. For that, turn off your device completely and hold volume down and power buttons for a few seconds. Once into TWRP, take a full Nandroid backup. Tap the Install button and select the SuperSU file. Swipe through the confirmation action below and start flashing. Once done, reboot to system. For a detailed tutorial on how to use TWRP, click here. Method 2: How to Root Android 8.0 Oreo OS using Magisk method? This is one of the latest and most effective ways to root any Android device. Magisk is the newest rooting method. You will also be able to hide root, bypass SafetyNet, and much more. Magisk 14 now supports Android 8.0 Oreo. Step 2: Download latest Magisk version from above. Step 3: Transfer it to phone storage. Step 4: Reboot into TWRP recovery. Step 5: Flash Magisk zip. Step 6: Reboot into system. Step 7: Open Magisk Manager and start granting root access. Method 3 worked for me.Thanks. Previous Entry How to Install Android 7.0 Nougat on Nexus 5 and Nexus 7 with AOSP ROM Right Now?